Scholars of democratic peace theories argue that the causal mechanism of the democratic peace is founded on the internalized liberal norms of democratic societies, which are subsequently assumed to be lacking among citizens of societies of different regime types. I argue that the corroborating results of earlier empirical work are overextended and that the mechanism should be empirically tested using a comparative perspective that considers the variance of the independent variable. 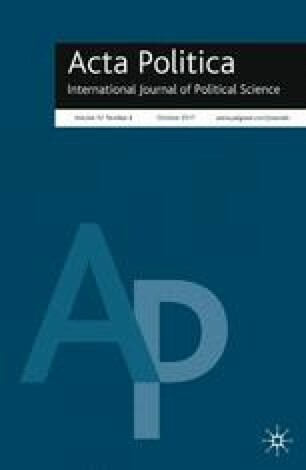 This article provides experimental evidence that compares the impact of liberal norms on a population residing and socialized within a democracy (the Netherlands) with a population residing and socialized within an autocracy (China) and their respective supports for war with another state. The comparison shows that the level of liberal norms in the democratic experimental group, although significantly higher than that in the autocratic experimental group, does not influence the support to go to war. Moreover, the threat of the conflict turns out to be the key indicator for the support for war among both groups. This finding provides a clearer understanding of the relationship between regime type and the use of force, and has important implications for democratic peace theories. The online version of this article (doi: 10.1057/s41269-016-0002-4) contains supplementary material, which is available to authorized users. The author is grateful for helpful feedback from Petr Kopecký, Niels van Willigen, Michael Meffert, Arjen Boin, Lee Seymour, Rebekah Tromble, Adam Chalmers, Wolfgang Wagner, Margaret Hermann, Naomi Ellemers, Daniel Thomas, Dirk De Bièvre, conference participants of the Dutch-Flemish Politicologenetmaal 2012, two anonymous reviewers, and the Acta Politica Editorial Board. She also thanks Dani Stockmann, Zheng Li, and Zhang Jie for their invaluable help to collect the data from China. This paper is a newer version of Femke’s MPhil thesis, for which she was awarded with several thesis awards, including the “Daniël Heinsius Thesis Award” of the Dutch Political Science Association (Nederlandse Kring Voor Wetenschap der Politiek) and the Flemish Political Science Association (Vereniging voor Politieke Wetenschappen).